The molded pulp is a kind of three-dimensional paper making technology. With special mould, the paper pulp making machine can make different shapes of paper products, such as paper egg tray, apple tray, egg carton, shoe holder and so on. The raw material of making egg tray is waste paper that contains paperboard, wastebasket paper, waste white edge paper and so on. 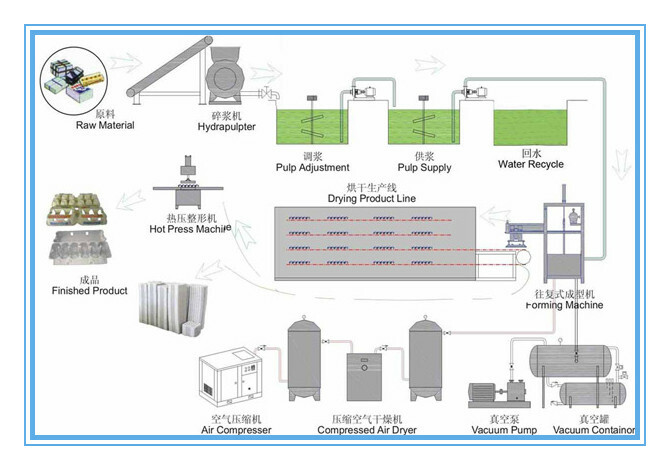 Pulp egg tray making machine is put forward in order to solve the “white pollution” problem. 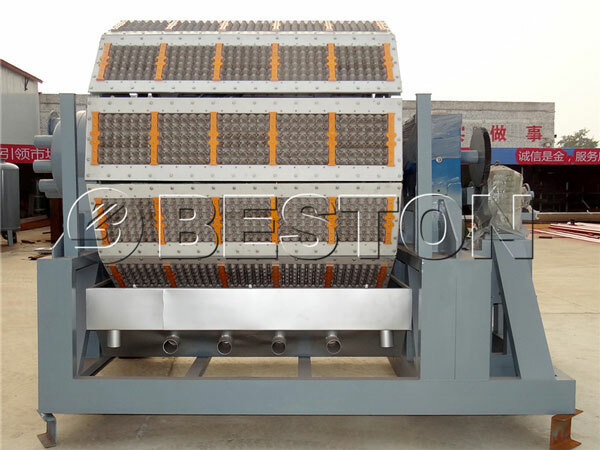 Because the raw material of paper egg trays can be recycled or easily disintegrated, the paper egg trays is used widely to replace the EPS products. So, the pulp egg tray machine has great investment potential and bright developing future. 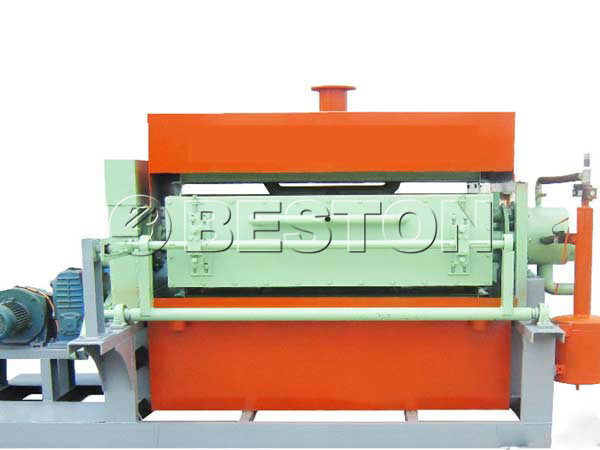 We have many types of the machines for sale: BTF-1-3, BTF-1-4, BTF-3-4, BTF-4-4, BTF-4-8, BTF-5-8 and BTF-5-12. 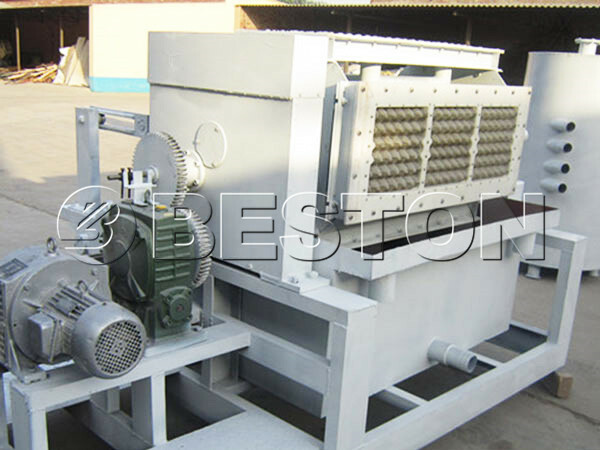 We Beston Machinery manufactures the pulp moulding machine on the basis of advanced technology, high quality, high output, easy operation and long service life cycle. You can buy our machine boldly and trustingly. In order to reduce your investment cost, we have been focusing on improving the production technology for many years. Simple and useful production technology. The workers can master and apply the production technology and skill after a short period of training. Meanwhile, the high localization degree of pulp molding equipment is easy for popularizing the paper and pulp industry. Wide source and low cost of raw materials: in our life, there are a large amount of waste paper. You can get waster paper easily. The cost of waste paper is low. Good plasticity and high cushion performance. Pulp molded products can prevent the eggs from collision. Light weight, low recycle cost, reusability, good protectiveness, high interchangeability. Environmental friendly: from the production and use to waste dispose, there is no pollution. High air permeability: it is good for packaging the fresh product. Convenient transportation: paper egg trays have small volume and can be overlapped. Therefore, they are easy for transporting. 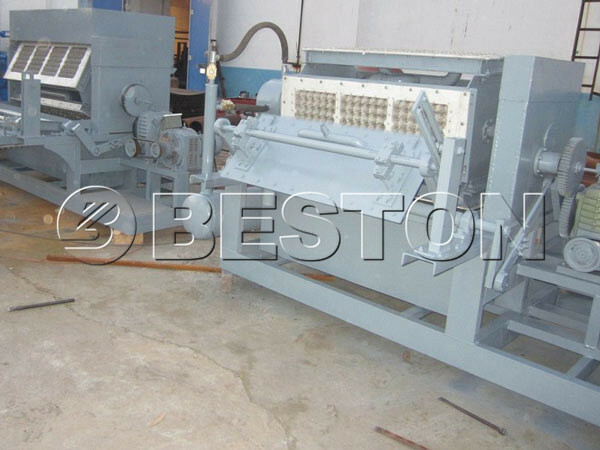 Paper molded products manufactured by our paper pulper machine have so many advantages. I believe you will earn lots of money from the paper pulp industry. Making paper pulp: put the raw material( waste paper) and water into pool. Use the hydrapulper to mix the material into paper pulp. In the mixing process, you should make sure appropriate concentration of slurry, high evenness. Forming: put the paper pulp into the mould, the egg tray forming machine can squeeze the water out. Then, wet paper egg trays are produced. Drying: after molding, the paper egg trays have a mass of water( approximately 55-60%). 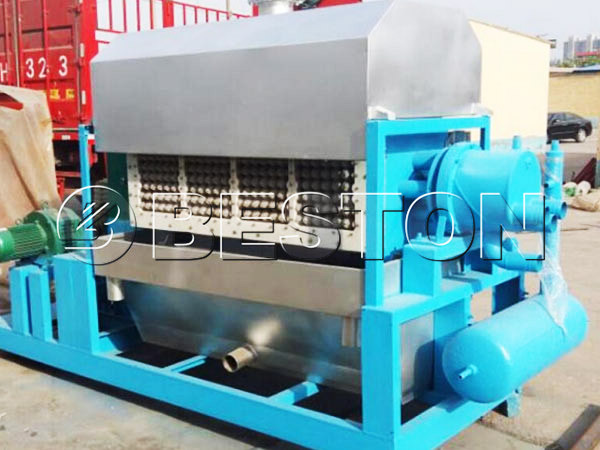 In order to reduce water content, you should use the egg tray drying line. In the process, you can choose the coal, diesel or natural gas as the fuel. 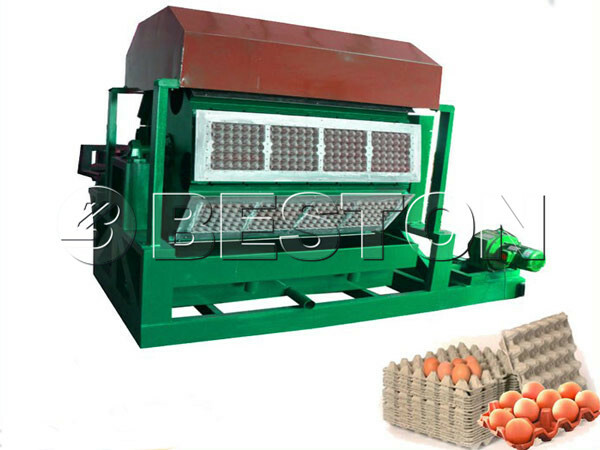 Pressing: through pressing overlapped egg trays, the volume of egg trays can be reduced greatly. It is easy and convenient for transporting. 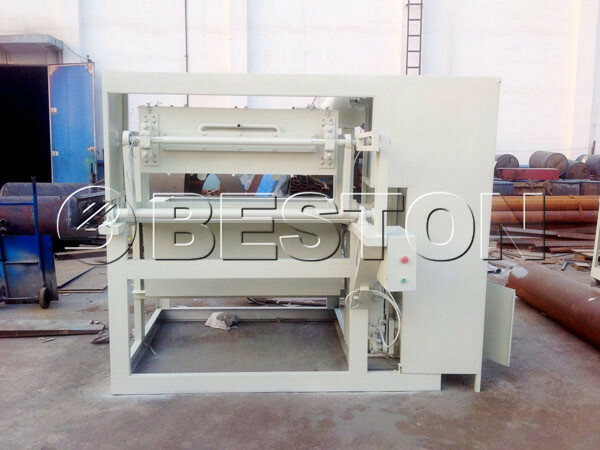 The above are the manufacturing process of egg tray moulding machine. If you want to know more clearly, you can see the production video of pulp molding machines. Various output capacity and configuration of paper pulping machine can be customized based on different needs of customers. The pulp making machine price is competitive. Choosing our pulp and paper machinery can save you a lot of money. 1. We will answer you the first time we have received your inquiry. 2. 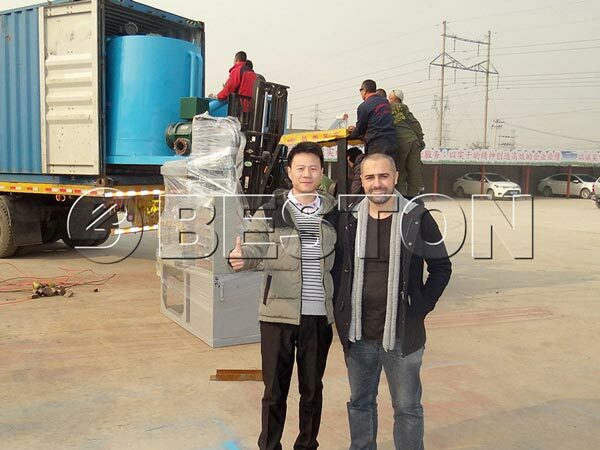 We will send expert to help you to install the machine as well as train your workers if you need. 3. We have professional after-sales service staff to help you solve any problem immediately which you may meet. As one of pulp and paper machinery manufacturers, the pulp moulding machines and paper making machinery manufactured by us all have first class quality and reasonable price. We are looking forward to having long term cooperation with more customers. We will serve you with all our heart. If you need the machine, email or chat with us right now!